For anybody who was a kid in the 1970s these words, spoken over the opening credits of the cult TV series The Six Million Dollar Man, are etched in our collective memory. 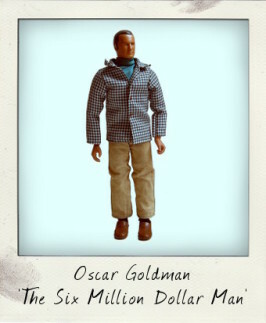 The title role of Steve Austin was played by Lee Majors, and like many a pop culture icon of that period, he soon found himself immortalized in the form of a 12-inch tall Kenner action figure, as were the characters of Steve's boss Oscar Goldman, and enemy Maskatron. 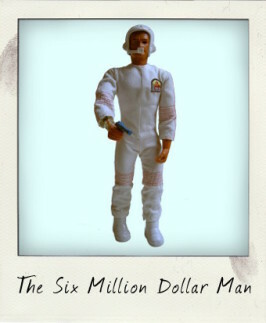 The Six Million Dollar Man action doll featured many interactive items such as a bionic eye that you could actually look through, a bionic arm that would lift items, and surely the most memorable feature - roll-back skin on the arm that revealed interchangeable and removable bionic elements. Indeed, these early figures with those removable bionic modules intact, are highly sought after by action figure collectors. The Bionic Woman, a spin-off show starring Lindsay Wagner as Jaime Sommers spawned its own action figures of the star and her arch adversary Fembot.